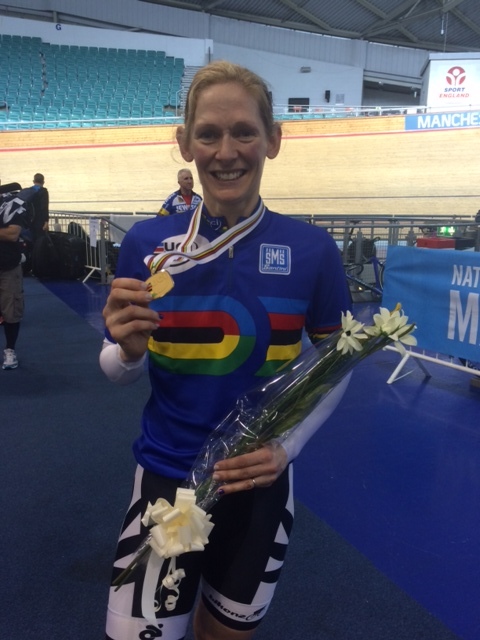 World master IP champ Erin Criglington has today successfully defended her rainbow jersey at the Worlds Masters Championships in Manchester. 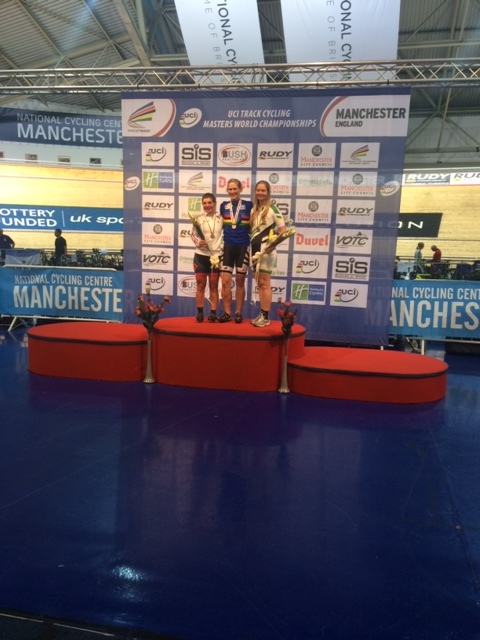 "Today was IP day for the women and the day I was to defend my rainbow jersey. Qualifying this morning saw our age category being combined with the 45-49 so we were effectively racing 40-49 with a separate podium for each. "I qualified second fastest in the combined age category in a time of 2.36.388 (unofficial from Neil's watch) - and fastest in the 40-44 age group. In hindsight I was a bit disappointed with my ride as I rode to my rider rather than my own race. I had however done enough to make the gold-silver ride in the finals. "In the evening session we had a plan to ride my race - good start, float the second lap and bring it on from there. Neil was only going to call up or down after lap four. I was up against Janet Birkmyre from GBR - the fastest qualifier. The race plan went well and, after being down for first four laps, I brought it back on lap five and Janet never came back from there. So I managed to win in a time of 2.34.754 (unofficial Neil time again) and successfully defend my rainbow jersey!! "It is such an awesome feeling to hear the national anthem being played and the NZ flag being raised!!! Next race is the scratch race on Tuesday." Huge congratulations Erin from all the crew back home.